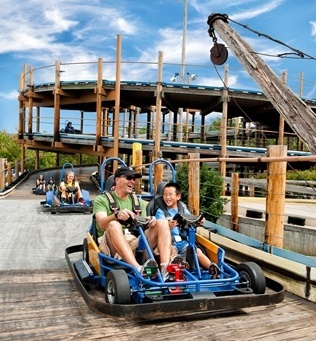 Go-Karts, Go-Karts, and More Go-Karts! Branson is the land of recreation, both indoors and out! And when it comes to having fun outdoors, you can never go wrong with zipping around on a go-kart track! 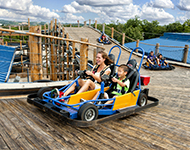 Speaking of “track,” the biggest, baddest, and bestest go-kart fun in town can be found at The Track Family Fun Parks; with five unique sites around Branson, you’ll find a track that’s perfect for every member of the family. Wood or metal, flashy or straightforward, long or short, speeding around or just tooling along, you have all these choices and everything in-between! 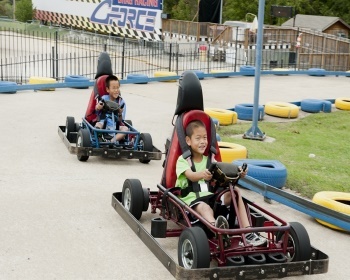 Riding Go-Karts at The Track Family Fun Parks! 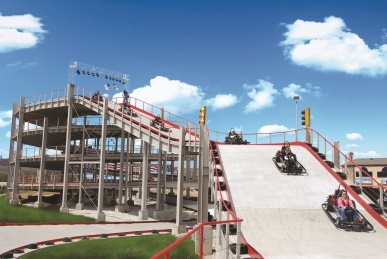 The most daring won’t want to miss all three, and very different, high rise go-kart attractions. 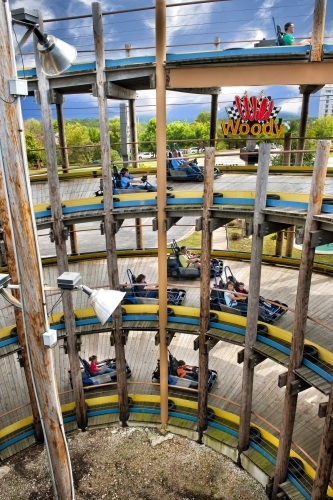 Branson’s very first wooden track, the amazing Lumberjack, can be found at Track location #5. It features a full spiral, two mini spirals, and a thrilling blind peak! Total track length: 1,186 feet. Maybe steel is more your style, then hop on the Heavy Metal High Rise, found at location #4, it reaches over four stories into the sky and features an exciting three-tiered slope back to the ground! Total track length: 1,200 feet. Then there’s the wonderfully wicked Wild Woody! A four-story climb with a three-tiered down slope; lit up with rock & roll stage lighting, it’s a fantastic sight to see as you drive along Branson’s famous Strip! Total track length: 1,440. Hit the ‘road’ in a go-kart! Well, not literally of course; there’s a great Road Course for go-karts at Track #3. It offers tighter and higher banked curves, and has more elevation changes than a traditional concrete track. It’s a rather long course, so it easily handles a higher volume of karts, making it perfect for the whole family to be on the course together! Also at Track #3, you’ll find the Sprint Track. It might look like it’s for the little kiddos, but don’t be fooled at first glance…it’s strictly for the grown-ups (no passengers allowed — and valid driver’s license required). It’s not a long track — only 275 linear feet, but it’s banked and the speed is amped up for a breathtaking ride! You’ll discover a traditional family-style go-kart experience with the Classic Go-Kart track found at locations #3, #4, #5, and Pirate’s Cove. Each location’s classic track design is unique and feature varying go-kart models. At Track locations #3 and #4, you’ll find Rookie Go-Karts; these are kind of like the next step up from kiddie karts; a little bigger, a little faster, and larger ovals for track designs. 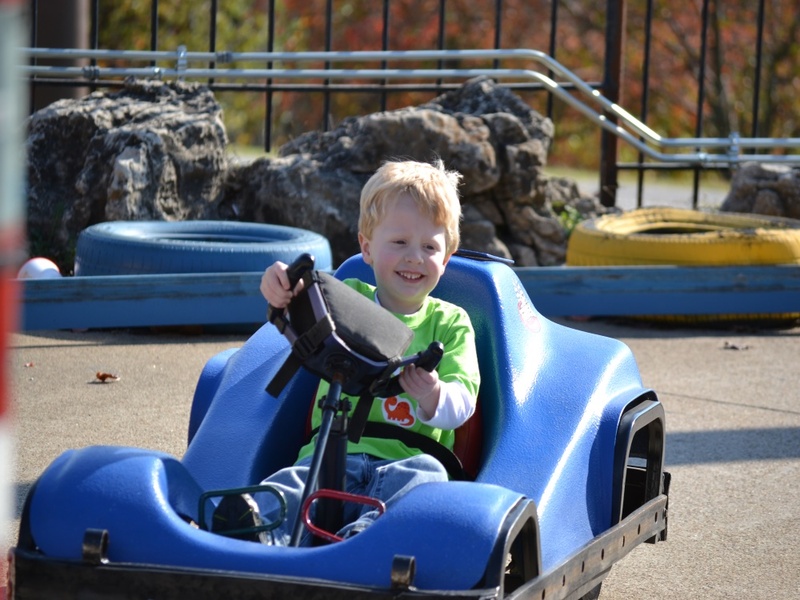 Kiddie Go-Karts can be found at both the #3 and #4 locations. Just the right size and the right speed, but with that grown-up feel of driving for the little ones! A controlled environment and a whole lot of fun to watch for parents! Want to ride go-karts? Well, you’ve hit the jackpot in Branson at The Tracks Family Fun Parks! Have the need for speed? 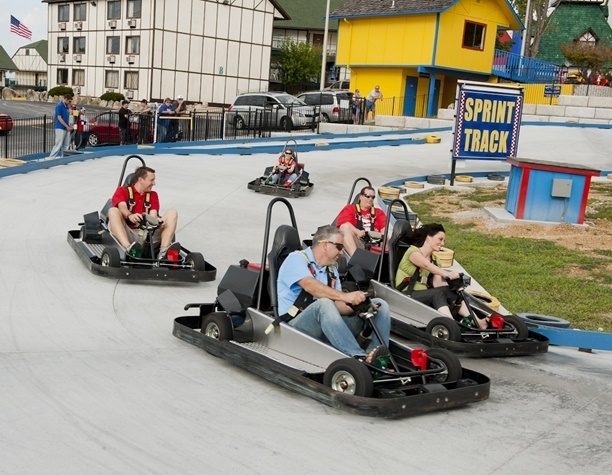 You’ll also find go-kart fun in Branson at the Xtreme Racing Center, where you’ll discover Sodi high speed racing karts that reach speeds up to 40 mph!